Anyone can lead a workshop at Epic Skill Swap! Check out our workshop submission process page and our resources for workshop leaders to get started. 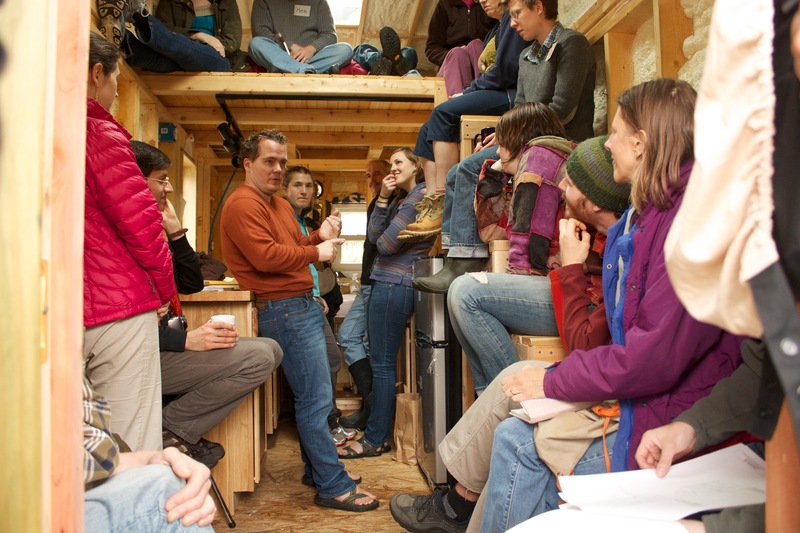 Tiny house workshop at ESS 2014. Ways to be a better citizen/consumer/activist, etc. Over the past couple years, we’ve seen a similar pattern play out for a lot of people. You may show up at your first Skill Swap thinking, “I don’t have anything awesome to teach. I’ll just go to workshops to learn.” And this level of participation is totally acceptable. But by the end of the weekend, most people say, “Oh…so that’s what it’s all about. Actually, I think I do have skills to share. Next year I want to teach…” This is a nice thing to figure out. But remember that next year’s Skill Swap is a long way away, and an extra year is a long time to wait before you get to feel empowered by the experience of teaching a workshop for a group of great people in a supportive and accepting setting. So if you’re thinking you have nothing to offer, take a good look at the list of last year’s workshops and the proposals for this year’s, and ask yourself whether you know how to do anything awesome enough to be on this list. We find that in most cases, the answer is a resounding yes.